Location: In the far north of the Istrian peninsula, the southern part of the city of Umag, in the location of the demolished cement factory in Umag, 3 km from the city center. 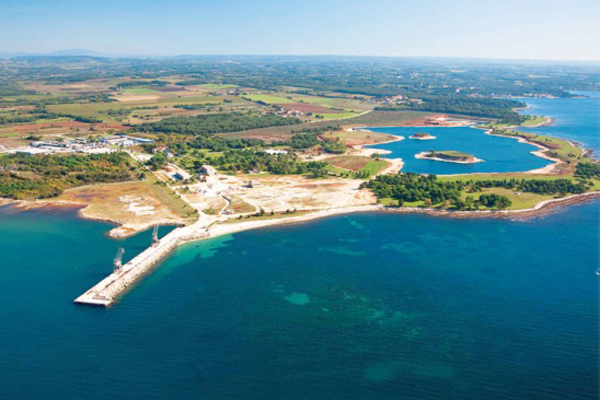 Planned construction in a separate field of tourism in the tourism development area “KRAVLJI RT T2” called TERRA ISTRIANA, building coverage of 15.10 ha for 2.270 beds and Marina Umag KRAVLJI RT for 200 berths. The planned intervention based on valid spatial planning documents: Regional Plan of Istria (“Official Gazette” No. Istria. 2/02 and 1/05) and the Spatial Plan of the City of Umag (Official Gazette of the City of Umag 3/04 9/04 correction), and its alignment with the Regulation on organization and protection of the coastal area (Official Gazette of the City of Umag 6/06) and amendments of the Regional Plan – the decision of 21/07/2008. and the final decision of the City Council of 15/07/2010 for the implementation of the Urban Development Plan “Terra Istriana Official Gazzete of the City of Umag no. 07/10. Projected rural tourist resort with villas, which will cover about 15 hectares and others 100 hectares with accompanying amenities: beaches, boutiques, a variety of centers with its offer in the modern tourism and the marina with 200 berths which will be able to accept the largest mega yachts. Guests will not only enjoy the healthy food, but will be able to participate in fishing, preparing fish, the olive harvest and similar, and in addition visit the existing wildlife park full of deer, roe deer, mouflon, sheep, goats and donkeys.